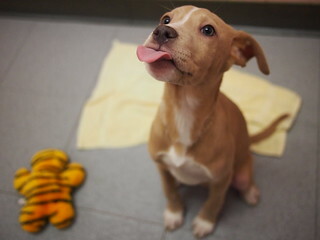 Many owners will tell you that owning a pup is just like having a child; they get into mischief, they always want to play (putting their favorite ball or toy in your lap when you’re trying to work), and even try to eat dessert before dinner time, which ruins their appetite. However, there are a few things your pup can’t do on their own, such as brushing their teeth before going to bed. 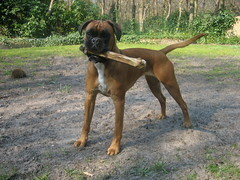 And while the regular chew bone will help keep some issues at bay, it’s essential that every dog owner understand the importance of oral hygiene. Jaws can sometimes be an intimidating sight for the new pup owner. Raising your pup to be okay with you handling their mouth is important and needs to be started as soon as possible. Of course, with that big, pink bologna tongue hanging out in there, things won’t seem so intimidating after all. Like humans, dogs also have two sets of teeth in their lives, one set as a puppy and the other that grows when they reach four to six months. After their adult teeth come up, dogs won’t grow any more teeth and since there aren’t any canine dentures, it’s important that you help them take care of the ones they have. There are four different types of dog jaw alignments, some of which can be more vulnerable to tooth problems. Be sure to consult with your veterinarian and discuss how often and what oral hygiene issues you may need to specifically look out for with your furry friend. My, what big, dirty teeth you have! Most dog mouths don’t have problems with cavities, but over time small problems can turn into serious issues, such as gum infections. Tarter is one concern, and is especially visible to the naked eye. It doesn’t take much to spot tarter buildup, specifically around the molars when that rascal of yours takes to smiling. Tarter buildup comes from calcium salts and hard water type deposits that accumulate on the teeth when eating and drinking (distilled water is ideal). Over time, buildup of tarter can lead to gum infection and eventual tooth loss, which is why it’s important to make sure your pup brushes their teeth regularly. For those pups with a sweeter diet, such as treats that happen to “slide” off your plate on occasion, tarter may not be the only problem. Softer foods (often including sugary goodies) also tend to get stuck in the gum line, thus causing gum decay and recession of the gum, leaving your pup’s teeth even more vulnerable. Bones and chewable treats that are tough will allow them to remove the tarter buildup and debris from their teeth and gums. If you’ve noticed, some pups enjoy chewing on sticks as well. It’s not ideal, but it is an instinctive way that helps clean their teeth naturally. In addition to chewable and dental treats, a good tooth brushing should be done every two to three weeks depending on your dog’s jaw type and diet (soft foods may require a tighter schedule). But getting in your pup’s mouth and successfully brushing is a challenge on its own. Few pups are going to want to sit still for such an exercise, especially if they think it’s potentially a game they’ll incorporate a few evasive techniques (rushing in and out of the room or teasing). Rather than jumping right into the brushing and scrubbing, you’ll need to get your pup used to you putting your fingers in their mouth. That’s going to be the hardest part, especially since dogs seldom put anything in their mouth they don’t chew on or eat. Start by working their lips to allow you to see their gums and teeth. Don’t be fooled by that big pink tongue, as some will use it to try and block your view or even to try to intercept your finger or brush. At first, it’s likely they’re going to push your fingers out with their tongue and may try to chew a little. Remove your hand when they do. You want the situation to be as soothing as possible, so you don’t want to scare or intimidate them into fearing when it comes to getting their teeth brushed. Getting your pup used to you handling their mouth is essential. If they don’t get used to you at least looking at their mouth (few will enjoy this), it’s going to be ten times harder to get in there and brush when it’s most important. After they’ve successfully examined their teeth, offer them a treat (preferably something dental in nature) to reward them for good behavior. This will positively reinforce the situation, making it easier to inspect and brush their teeth in the future. As your pup’s faithful friend and guardian, it’s your duty to make sure they enjoy a happy and healthy life. And everyone knows that happiness starts with a smile. One of the most annoying problems a dog faces is the very tiny and dangerous tick. These nasty parasites love to feast on our healthy pups, and are renowned for infesting both humans and dogs alike. Although they may be tiny in size, they present a great danger to your dog’s health and comfort. Aside from the natural annoyance and forcing your dog to scratch that one spot incessantly, ticks are dangerous mostly because they’re a host for bacteria and diseases, which are easily transferable to your dog. Such diseases include Lyme disease, Ehrlichiosis, Rocky Mountain spotted fever, Anaplasmosis, and Babesiosis. As your dog’s protector and companion, you need to be able to locate these nasty critters before they start causing harm. 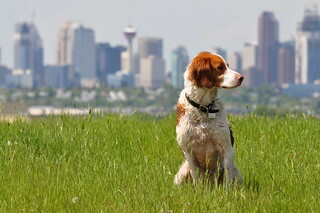 There are certain locations to beware of, such as tall grass and dog parks. After a visit to such locations you should always do a careful inspection of your dog’s body. Keep in mind that ticks love to attach themselves to warm areas where blood is easily accessible. They are often found in skin folds which make perfect hiding places. Other, far more visible areas are behind and in the ears, and on their belly, often close to the groin. What you’ll need to do is run your hands along their body (with and against the fur), searching for any lumps on the skin. In more sensitive areas, especially with long-haired dogs, you’ll need to part the hair to inspect closely. When you do find a tick, you’re going to need to remove it as safely as possible. Don’t just pull it off with your fingers or try methods like the hot match, nail polish, or alcohol, since these can injure your dog. First of all, you’ll want to wear latex gloves, since the tick can turn and latch onto your skin after you remove it. Plus, it’s far more sanitary. It is preferable to use tweezers, but your fingers will work as well. Just make sure you do not squeeze the tick, since it would inject bacteria and any diseases directly into the area, causing unnecessary infections. Then, slowly pull the tick directly away from the site. They will sometimes tug a small portion of your dog’s skin away with it, but is no cause for alarm. If the head doesn’t release, you can use tweezers to remove it, but it will naturally fall out without any complications. Afterwards, apply a disinfected cloth to the area to stop bleeding and then clean the area with water and a little soap. It’s generally a good idea to keep the tick’s body in a sealed container in case any signs of ailment do affect your dog, especially if you live in an area renowned for tick infestation. Your vet can use the tick to more accurately diagnose your dog’s condition to ensure the swiftest and best treatment possible. Watch the spot for several days after, to see if there’s any sign of infection or other issues. As with most medical situations, prevention is the key to keeping your dog safe and healthy. The best thing you can do is keep your yard clean (doggy droppings hanging around are breeding grounds for fleas and ticks) and regularly mow your lawn. The harder you make it for the ticks to get to your dog, the safer your pup will be. It’s also a good idea to wash your dog regularly with a tick and flea shampoo. Tick and flea collars are recommended, just be sure that the manufacturer is trustworthy, and the same goes for topical repellants, which don’t always have the best results. There are numerous brands out there, but not all of them are healthy solutions for your dog. Some natural remedies are often appreciated, though it’s always best to consult with your veterinarian to make sure your dog won’t have allergic reactions to them. While some remedies, such as lemon juice and water are the common ones, one healthy remedy is Brewer’s yeast. It naturally detours ticks from latching on for a snack, and is great for your dog’s skin and coat health. It even works for humans too. Ticks can hop a ride on your dog in some of the most unexpected places. You might be visiting some friends, or even walking along in the park. Just be sure that you regularly check your dog for ticks and other parasites, and take precautions that will detour those nasty parasites from ruining your dog’s health. If used properly, their crate, or den, can become their favorite spot in the house and it helps control toileting because dogs will not use their crates as a bathroom. However, you have to pay attention to the size of your dog’s crate. Make sure it is large enough for your dog to stand, turn around, and lay down in comfortably but not so large that they can use a corner as a bathroom. Where you put the crate is equally as important. Dogs are very social and want to be part of the family activity. The crate should be in a bright area of the home where people are. 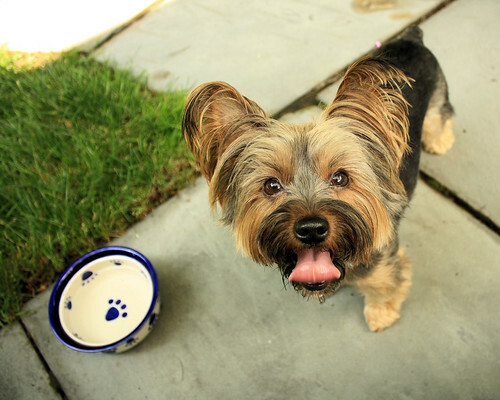 Your puppy’s diet is also very important in housebreaking your dog. A good premium food (no fillers, additives) will provide the nutrients your growing dog needs while ensuring their toileting isn’t compromised. Dry kibble is best, but you can use a little wet food every now and then. Be sure to feed your dog at the same time every day to control potty habits. Be supportive, active, and encouraging with your pup. This is a new and exciting time for the both of you. Use potty training best practices and soon the transition will be over! For many pet owners, the high-rise developments in the city can make enjoying a daily walk a little more difficult than it should be. There’s traffic, stairs to navigate, numerous people, and even limitations on where you can go (“No dogs allowed” signs on some streets and buildings). But, it is still important for every dog to get plenty of exercise and have the opportunity to take care of their potty needs. When walking your dog in the city, it’s important that you consider a few precautions and safety measures to ensure that your walk is safe and enjoyable. Your first task is to establish a safe route for you and the dog to take. Stay on paths and walkways that are familiar to you. And remember, only walk where there are sidewalks. Don’t walk in the street, especially at night. Stay on pathways that are well-populated and well-lit. If you can, find a dog-friendly park near your residence to use for walks. This will keep you away from many of the roadside dangers of the city and provide a much friendlier atmosphere for you and your dog to enjoy. Additionally, be sure that you walk on the correct side of the road- the left side is for pedestrians and the right is for bicycles. This will allow you to clearly see oncoming traffic so that you can adjust or move away from the side of the road- especially in case it’s recently rained. You don’t want to get soaked by a passing car. Make yourself visible and dress flashy- both you and the dog. There are several methods to improve your visibility, bright clothing is one. There are reflective collars, harnesses, and safety vests available for the canine breed. These will help both during the daytime and evening walks in the city, enabling you to quickly spot your dog and help others see where you are in poor lighting or bad weather conditions. There are also the bad weather dangers, such as ice and wet, slippery steps. These are common in the city, in which case you may need to adjust accordingly. Avoid areas where water rushes when it rains or stairways that can be slippery when it freezes. Understanding the nature of your dog is something a lot of people don’t expect to become a serious issue. 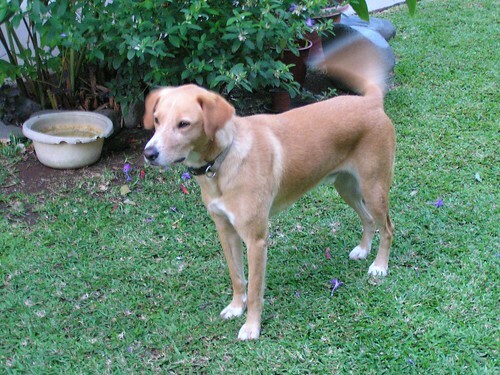 But, in the busy streets of the city, the sound and site of traffic can spark a dog into pursuit. Be cautious and avoid situations where your dog may be difficult to control. Consider that there will also be other people and often other pets. How does your dog react to them? Is it friendly or aggressive? Knowing your dog is important, but you can never be too sure how they will react to another dog- or how that dog would react to them. Walking your dog in the city is a very different experience, especially if you’ve recently relocated. But, as long as you take the right precautions, you can ensure that both you and the dog will experience a safe and enjoyable walk, wherever it may be. The holiday season is coming up, which usually means it’s time to pack up the car and hit the road for an exciting trip. Everyone loads up their supplies and grabs a few snacks in preparation for the road ahead. In the midst of all the excitement, we sometimes overlook our pets, especially ones that can also come along, such as the dog. As such, you must consider what your dog is going to need to stay safe and happy during the trip. When it comes to your dog and travel, it’s important to keep in mind that the situation is not the same for them. Are they usually active? Do they whine a lot? Are they going to need you to make additional stops during the trip so they can take care of their business? Some dogs get uneasy or excited and like to move around the cabin when the car is in motion. Unfortunately, the road can sometimes be unpredictable, and it’s up to each dog owner to prepare their pup for the road ahead. Safety in the car is one of the most important things for a dog owner to consider. The use of a crate or safety belt/harness should be part of your packing list. In case of a sudden stop or accident, a loose dog will become a projectile and can hurt themselves or others. For everyone’s safety, keep your dog secured during the trip. A safety harness: It is reliable in most cases and allows your dog to move around and interact during the trip. Perhaps they like to get a good view out the window and watch the traffic moving by. If so, be sure to select a device that will secure to sturdy areas of the vehicle, such as the safety equipment installed (avoid ones that strap to the seat only). Don’t place them in the front seat, especially if you have airbags installed. A Crate: This is the best way to keep your dog secure. In most cases, it allows your dog to feel more comfortable. Their crate is their den, and will help soothe any nerves or a little motion sickness. What about when it’s time to potty? At such a time, stay in areas away from the road or where any traffic is moving through. Also, avoid parking lots where debris such as broken glass can cut paws. It is necessary to address your dog’s ritualistic needs, but you don’t want to risk their safety in the process. Plan your feeding and watering times accurately. If you’re getting ready to load up and head out, don’t feed the dog right then. You may be asking for a stop right up the road. It’s a good idea to note your dog’s usual feeding and potty patterns so you can plan your stops accordingly. Road trips can be fun for everyone, so long as you keep safety in mind. 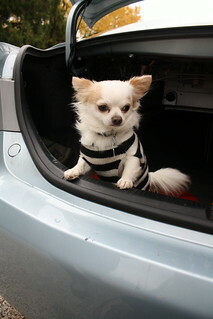 Prepare your dog for the road ahead and make sure that all the little stops in-between are included in your plans. Stay safe and enjoy the ride. Potty training your dog often relies on repetition and consistency. Unfortunately, our lives are not always steady, and there are times when we find ourselves relocating to a new home or visiting a new location for an extended period. Regardless of why this occurs, this change can impede the process of potty training if you don’t plan to help your puppy to adjust. Moving to a new place will affect your dog in many ways. During the potty training period, it is important that you realize one thing- your dog has begun to develop habits and those habits will carry over into your new home. So, consider the differences in locations. Has your dog been using a certain outdoor location, such as a yard? Was there frequent access, such as a doggy door? What will they have available to them now? If you’re relocating from a house with a yard to an upstairs apartment, your dog is going to be very confused. But, if you know what to do to help them familiarize between the two, the transition will be much smoother and easier for your dog to cope with. Associate their old area with the new. Do this by avoiding converting their potty area into something completely new and unfamiliar. A great way to maintain familiarity is to utilize a grass litter box before the move and after. They’ll adjust much better to their new potty location. This can even be helpful if they’re accustomed to eliminating in an outdoor location. The familiar grass will provide them with a comfortable place to potty. Develop and maintain the same schedule. Your dog will still want to have the same schedule during the day, so continue allowing them to potty at the same times they were able to before the move. Do keep in mind that new locations will often cause a dog to become stressed. Unfortunately, this can also result in diarrhea, which means you’ll need to watch for any early warning signs that they need to potty. Take them out more frequently in addition to their regular scheduled times. If you find yourself relocating to a new place, keep in mind that it is going to affect your dog and the development of their habits. While potty training relies on consistency and repetition, you can still provide them with a potty location familiar to them so that they can continue learning even while you’re moving. Safety isn’t something that many owners consider when the time comes to potty train their new dog. It is often considered a learning experience, just like a student in a classroom. But, even classrooms need to be safe in order for students to learn properly, so it’s up to you as a dog lover to ensure their safety when you’re teaching them the rules of the house. Teaching your dog to potty will mean that accidents can happen. A mistake or two might be normal, but overlooking medical problems is often a subject that brings about dangerous issues during or even later on. Problems with incontinence, infections or even worms can also cause accidents, since your dog might be incapable of controlling their bodily functions. If you are having trouble with excessive accidents, check with your vet about any physical ailments that could be causing the problem so it doesn’t go unattended. Disciplining is an important issue, and always keep in mind that puppies are extremely sensitive, both emotionally and physically. Physical discipline is never recommended, and is seldom effective in the training process. Also, remember that dog’s ears are sensitive, meaning they can hear what you’re saying. Getting louder doesn’t mean they’re going to hear you any better, but instead it is the tone of your voice that they pay attention to. Making the experience good for your dog is the best way to ensure safety and happiness. Teaching them through fun and games, and enforcing positive motivation are the best ways to ensure healthy development. Always keep their potty area clean. Even though you are trying to create incentive to potty in a certain area, removing any feces will prevent fleas, ticks, and ultimately worms from creating health problems. To go a step farther, consider an indoor dog grass litter box. You can maintain and keep your dog’s potty area clean so they stay happy and healthy. Keeping your dog safe is an important part of being a dog owner. Everywhere you go and everything you teach your dog should be for their complete benefit. After all, you want them to grow up happy and healthy, and that means that their safety should always come first. 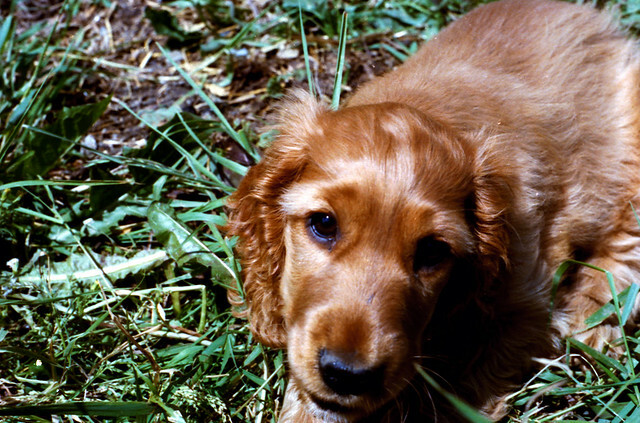 Housetraining your dog doesn’t have to be an incredibly difficult time for your pup. All it takes is the right teaching and your pup will be quick to learn. When it comes to housetraining your dog, there are several habits you should refrain from doing during the process. Avoid these “don’ts” of housetraining. Assuming your dog will potty on your schedule is a big misconception. This is a problem that many new dog owners first believe. But, it takes a while for a dog to become in tune with your schedule, and in the meantime, they’re probably going to potty when they need to. This usually coincides with their meal times. Dogs should be fed two to three times a day, and meals should allow about an hour between you leaving or bedtime so that your pup can potty before they sleep. Choose outside or inside when potty training. Using both at the same time can confuse your pup, teaching them that they can go wherever they want. If you’re starting with an indoor grass litter box, stick with it during the training process. If you start outside, refrain from using those indoor puppy pads even if they are a precaution. Another thing that you should never do is rely on your older dog to teach your new dog any tricks. While older dogs have their habits, your young pup will look to you for guidance. 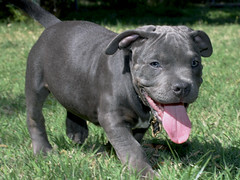 Even if your older pup is an ideal pup, you need to spend time with your new dog and provide the necessary teachings. The most important thing that you should never do is discipline your dog when they’ve had an accident in the house, especially if you didn’t catch them in the act. This only teaches them to be scared of you, and usually makes the problem worse. When an accident does happen, you’ll need to clean it up properly with enzyme based cleaners to remove any scent. 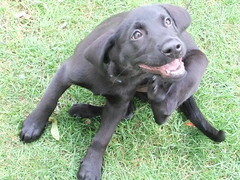 Rather than take measures to correct the problem, work on positive influences that make your pup want to potty outside. Remember that preparing your dog for life in your home, you have to keep the preventative mind-set during training. Rather than wait for a dog to do something the wrong way, teach them the right way with positive influence.